Ever noticed that the water coming from the shower seems to be so much hotter during the summer as compared to the winter? Tired of the kids taking super hot showers and using up all the hot water? 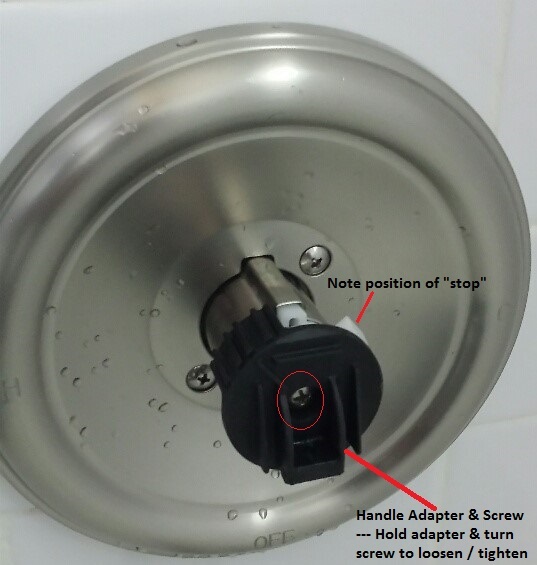 Sorry we can’t help you on the time aspect (that’s your battle though they do have timers for showers…), but adjusting the temperature coming out of the tap is an easy fix for most newer fixtures. Back in the good old days one was expected to be smart enough to adjust the water temperature so they wouldn’t burn themselves. Alas welcome to the land of law suits & we have to protect people from themselves… so companies had to create devices to prevent one from burning themselves. The down side, well the incoming cold water temperature is not constant so in order to have that nice 115° degree shower all year long you have to adjust it. The following is from a Moen faucet but many manufacturers use a similar method for most entry to mid grade lines. Under the handle is a hex screw which needs to be loosened or in this case removed so you can pull the handle off. Remember righty-tighty lefty-loosey, well that applies if you are looking up at it – in this case you turn it to the right / clockwise to loosen. This is called a handle adjuster which is what holds the handle on & allows for it to move properly. 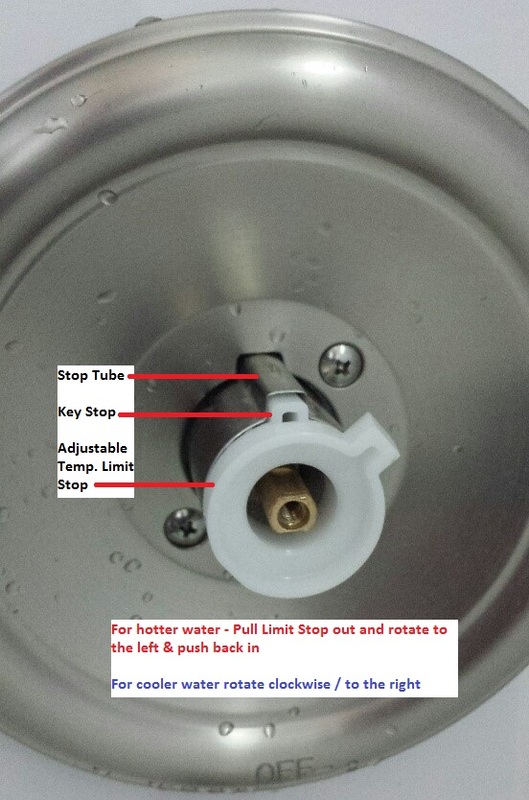 Hold the adjuster with your hand (or you are going to get wet) & turn the screw counterclockwise / left to remove it. Then simply pull just the black piece off & set to the side. Notice the white tab behind it – note which position it is. Above is a shot of how they control or “temper” the water temp. 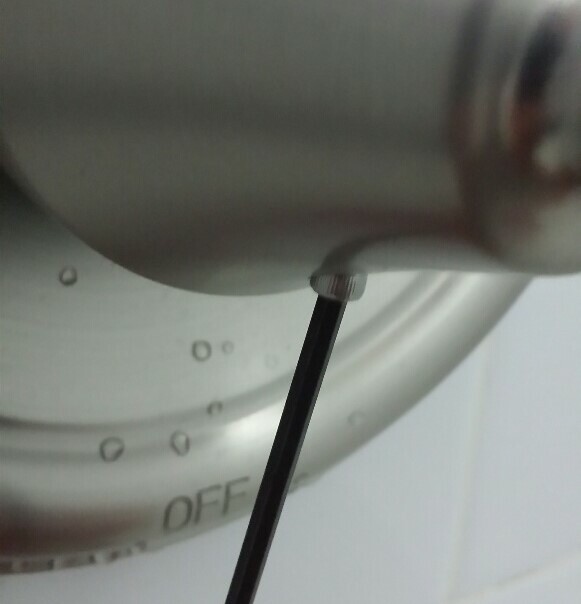 The stop is to prevent the handle from opening up the hot water valve to far allowing for scalding water to come out. During winter time you would probably need to pull the stop out & rotate it just a bit to the left to allow more hot water in to counteract the cooler water coming in from the cold water supply. In the summer you would need to limit the amount of hot water thus turning it to the left. Granted everything is affected by both the temperature coming from your hot water heater & cold water intakes but each click can equate to a 2 to 3 degree difference in temperature. If you need to adjust the temperature up or down still, pull the adapter off & turn another click or two as mentioned above & retest. once you have the ideal temperature, simply reinstall the handle & give it one final test. Just remember that most manufacturers & reality require you to do this a few times of the year. If you do decide to change the temperature at the tank to save energy you will also have to readjust.